With the majority of the capital's businesses destroyed, Haitians have gone from poor to destitute. Editor's note: Since becoming State Department producer in 2000, Elise Labott has covered four secretaries of state and reported from more than 50 countries. Before joining CNN, she covered the United Nations. Washington (CNN) -- Five years after the Indian Ocean tsunami devastated the Indonesian region of Aceh and killed 200,000 people, reconstruction is still under way. The destruction unleashed by the Haiti earthquake is comparable, but the challenge to rebuild the country is even greater, and the recovery process likely will take even longer. 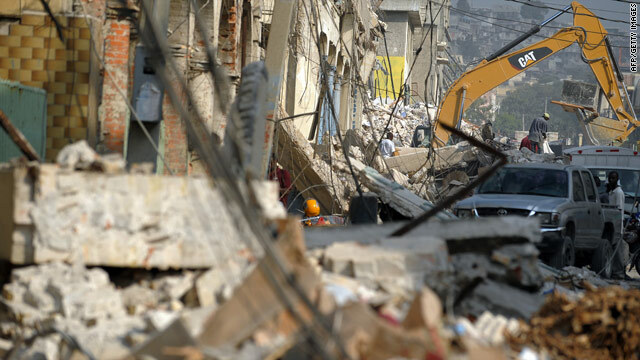 To call Haiti a "fragile" state before this month's devastating earthquake would be generous. Haiti is the poorest country in the Western Hemisphere and one of the poorest in the world, with unemployment at more than 50 percent and more than half of the population living on a dollar a day. Now about 400,000 people have been left homeless. And with the majority of the capital's businesses destroyed, Haitians have gone quickly from poor to destitute. With two coups, ongoing political turmoil and a series of natural disasters, most recently last year's devastating hurricanes, the government has never been particularly strong in delivering services to its people. Right now, Haiti's needs are immediate: clearing the rubble and providing a steady stream of food, aid and basic shelter for Haiti's people. It will also be important to make sure there is enough clean water and sanitation to prevent a second wave of deaths from disease. It will take billions of dollars to help Haiti rebuild its shattered infrastructure but the world appears ready to help. There is a growing chorus of calls for a "Marshall Plan" for Haiti, similar to the one that rebuilt Europe from the ashes of World War II. We have been here before, though. The international community has sent billions of dollars in aid to help Haiti after previous calamities only to have to start from scratch after the next one. The goal for the U.S. and aid groups in Haiti is for this time to be the last time -- to rebuild the country into a better-functioning, economically more stable nation that can withstand future setbacks without relying on international aid. For a start, schools need to reopen and some sort of stimulus will be badly needed to restart the economy. Hundreds of thousands of Haitians, homeless and walking the streets in despair, will need jobs. Further unemployment could cause even greater chaos and insecurity. The United States and United Nations are already working on a fast-impact jobs program, paying thousands of Haitians small sums to clear damage and work on reconstruction projects. Getting money flowing in the country will reopen markets and could restart the dormant engines of industry. Haiti's vast diaspora could play a vital role in rebuilding the country. Haitian Americans have grown into one of America's most successful immigrant communities. Hardworking, educated and upwardly mobile, they could make enormous contributions if they go back home to work on the country's reconstruction. But any reconstruction plan for Haiti would have to go beyond rebuilding the country's damaged infrastructure. Money is no substitute for leadership. Which is why a true "rebuilding" effort must start with Haiti's fragile government and weak institutions. Ultimately Haiti must learn to do for itself what the world has done for it. Ironically, U.S. officials say since taking office two years ago, Haiti's president, Rene Preval, had made a lot of progress to build Haiti into a more functional state. While he is not viewed as a charismatic figure, he is considered a competent manager and not corrupt as some who preceded him were. Since the Obama administration took office, Preval has been working with Hillary Clinton's State Department on a long-term development plan for Haiti that had earned high marks in Washington. Sadly, his plans are in ruins. The government, while still in power, is unable to deliver any services for its people. It remains to be seen whether Preval can recover from the crisis to move Haiti forward. His toughest, and most important job, will be to inspire the trust of Haitians and give them hope in his vision for the country's future. The great danger is that donor fatigue could set in before Haiti's rebuilding efforts get going. While rebuilding Haiti will take years, the impressive outpouring of generosity the world is displaying for humanitarian relief efforts could trickle to nothing -- like in Aceh -- once the cameras leave.